On Saturday night the T-Mobile Arena in Las Vegas, Nevada will host the biggest pay per view of the year in either boxing or MMA as the UFC Lightweight Title will be up for grabs when undefeated Khabib Nurmagomedov faces Conor McGregor in the main event of the evening. McGregor is the UFC’s biggest draw, and Khabib is McGregor’s toughest test to date in MMA. This blockbuster event will be getting a lot of attention in the mainstream media leading up to Saturday. The co-main event of the evening will be between Anthony Pettis and Tony Ferguson in the lightweight division. The winner of this bout will likely be in line for a future title shot against the winner of Khabib and McGregor. The undercard has some intriguing fights throughout. Ovince Saint Preux will face Dominick Reyes in the light heavyweight division, Derrick Lewis will face Alexander Volkov in the heavyweight division, Sergio Pettis will face Jussier Formiga in the flyweight division, and Michelle Waterson will face Felice Herrig in the Women’s Straweight division. The UFC tends to show more fights on their pay per view offerings than boxing so five fights will likely be televised. The following is a preview of the co-main event and the main event of the night. The winner of the co-main event of the night will likely move on to a future title shot. Anthony Pettis was once considered a top rated contender, but he has struggled recently and has only gone 3-3 in his last six fights, and actually has a losing record of 3-5 in his last eight fights. Tony Ferguson has been on a roll and is currently riding a ten fight win streak. However, his activity is of some concern as he has only fought three times since the beginning of 2016, while Pettis has fought seven times since the beginning of 2016. Ferguson is 34 years old and three years older than Pettis. Ferguson will have a very slight two inch height advantage on Pettis. Both fighters like to finish their fight. Of Pettis’ 21 victories, 17 have come by way of stoppage. 18 of Ferguson’s victories have come by way of stoppage. There really is no such thing as an easy fight in the UFC. Pettis has defeated the likes of Michael Chiesa, Jim Miller, Charles Oliveira, Gilbert Melendez, and Benson Henderson. His losses were to Rafael Dos Anjos, Eddie Alvarez, Edson Barboza, Max Holloway, and Dustin Poirier. Ferguson’s only losses were to Michael Johnson and two lesser known fighters very early in his career. He has defeated the likes of Kevin Lee, Rafael Dos Anjos, Edson Barboza, Josh Thomson, Gleison Tibau, Abel Trujillo, and Danny Castillo. Pettis might have a slight edge in striking, but Ferguson has a strong edge in grappling. Ferguson was a NCWA Collegiate National Champion in Wrestling and was a high school state champion in Michigan. Pettis didn’t pick up on grappling until later on in his life. Ferguson should win this fight by decision. He’s never been stopped by strikes in his career, and that’s Anthony Pettis’ best weapon. 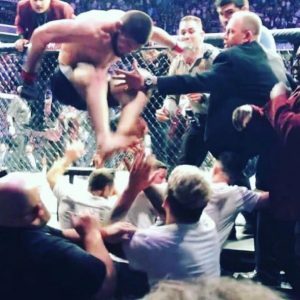 As stated earlier, there really is no such thing as an easy fight in the UFC, and that’s why it’s very impressive for Khabib Nurmagomedov to have an undefeated record. Khabib is a fighter with a very strong grappling background. He was born in Dagestan, Russia and has never lost. His win streak currently stands at 26 victories in a row. Both Khabib and McGregor are 30 years old, though Khabib will have a two inch height advantage on McGregor. Khabib has a history of injuries and trouble making weight, though he has made weight for this weekend. 16 of his 26 wins were by stoppage, with eight by TKO and eight by submission. McGregor’s excitement as a fighter is much more than his personality. Of McGregor’s 21 victories, 18 have come by TKO/KO and one by submission. Only two of his wins were by judges decision. Neither fighter can consider themselves to be super active since 2016. 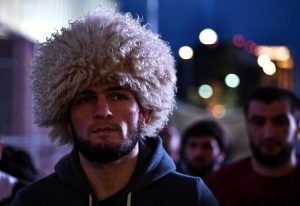 Khabib fought once in 2018, once in 2017, and twice in 2016. McGregor did not fight yet in an MMA cage in 2018 or 2017. 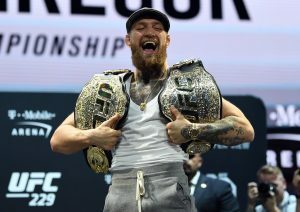 He fought three times in 2016 and was last seen competing in a boxing ring when he was stopped by Floyd Mayweather Jr.
McGregor has beaten the likes of Eddie Alvarez, Nate Diaz, Jose Aldo, Chad Mendes, Dennis Silver, Dustin Poirier, and Max Holloway. His losses were to Joseph Duffy, Nate Diaz, and Artemij Sitenkov. Nobody has ever beaten Khabib. He has defeated the likes of Al Iaquinta, Edson Barboza, Michael Johnson, Darrel Horcher, Rafael Dos Anjos, Thiago Tavares, and Gleison Tibau. One of the biggest factors that jumps out at this writer is that McGregor’s three losses were all by submission and he’s facing a fighter who’s known for being a very strong grappler. Khabib has finished 8 previous opponents by submission. If McGregor is going to win he’ll have to stop Khabib with strikes, it’s difficult to imagine him keeping the fight standing for five rounds. Even though McGregor recently signed a lucrative contract extension with the UFC and is their most popular fighter, his recent inactivity and weakness in grappling will likely be issues that Khabib will exploit. This writer feels that Khabib’s strengths will make for a very bad matchup for McGregor on Saturday.